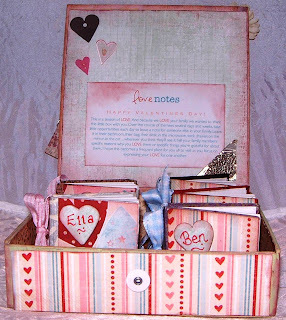 The idea is to write something nice in the books regularly. Should be interesting to see what what the boys write about each other! If it's not too offensive I might even copy a couple here. Don't expect to see many will you :) The box was from a class 3 years ago I never completed; the ribbon from card making; and the mini books and papers have been hanging around forever. You know how I like to recycle! Oh my gosh Suzanne....this is ADORABLE !!!!!!!! What a great idea, Suzanne!!! Can't wait to hear what they write!!!! Wow! 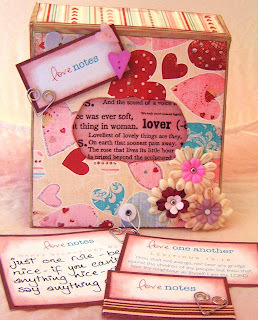 What a Fabulous take on the love note idea...way to go, Suzanne!